U.S. embassy in Beijing warns of terrorist threat to Americans over Christmas holiday. An armed Chinese policeman stands guard in the popular shopping and nightlife area of Sanlitun in Beijing on December 24, 2015. The U.S. embassy in Beijing issued a warning Thursday to Americans living in China’s capital of possible terrorist threats over the Christmas holiday. 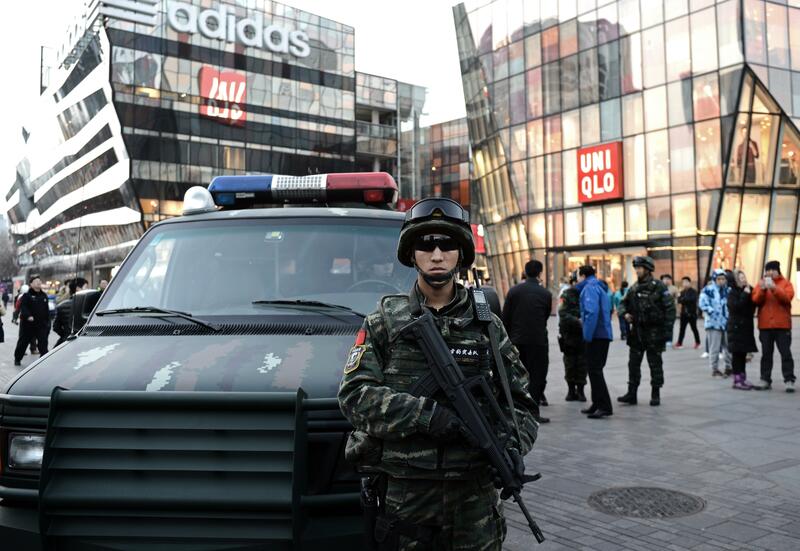 The embassy said the threat was centered on the Sanlitun area of Beijing, a popular shopping and nightlife district of the city frequented by expats. The British, French, and Irish embassies sent similar warnings. The U.S. embassy did not elaborate on the nature of the threat or its source. The targeting of foreigners in China is rare, although attacks not unheard of; the Los Angeles Times notes that such a high profile threat against Westerners is likely a first for the city. Authorities amplified the security presence across the city in the wake of the elevated threat. The Beijing police department issued a “yellow alert,” a medium-level security warning. “A yellow alert is issued when authorities have information about a significant and approaching threat to public security, state media said,” according to Agence France-Presse. “On Thursday afternoon, Sanlitun was swarming with camouflage-clad guards toting large black rifles,” according to the Times. “Miles away, another pedestrian shopping street, Wangfujing, was lined with police cars, their lights flashing. Authorities have placed roadblocks in at least one of the city’s embassy districts.” AFP also quotes Beijing police describing the heightened state of alert, which is expected to last through the New Year, as a way to “ “ensure good social order during the upcoming holidays” due to “the gradual increase of shopping promotions, celebrations and entertainment activities.” A New Year’s Eve stampede in Shanghai last year killed dozens.